No Exit, directed by Marc Beaudin – who directed last season’s Proof – will run weekends, Feb. 15 through Mar. 3. 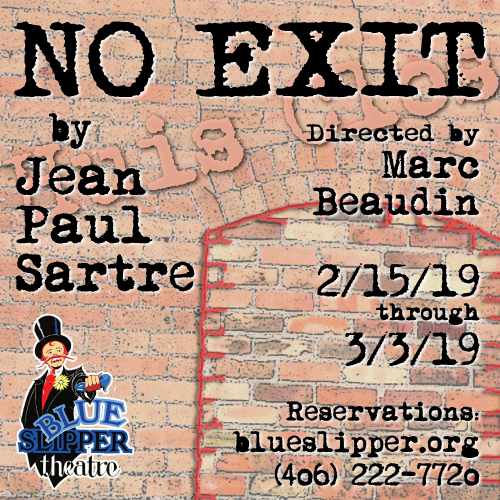 Livingston’s Blue Slipper Theatre kicks off its 2019 season with Jean-Paul Sartre’s masterpiece of drama and dark comedy, No Exit, opening on Friday, February 15, and continuing through Sunday, March 3. Performances are held Fridays and Saturdays at 8 p.m. and Sundays at 3 p.m. 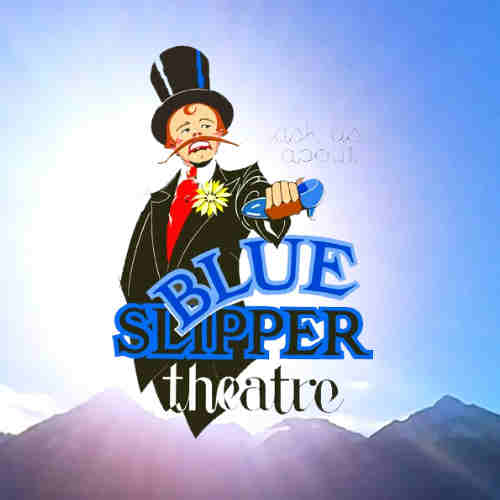 The Blue Slipper is located at 113 E. Callender. The play, with is famous line “Hell is other people,” pits three strangers, locked together in a room for eternity, against one another as they slowly come to realize that the torture in store for them in Hell isn’t racks and hot pokers, but rather each other’s unwavering gaze. The production features a contemporary, American adaptation of the French original that audiences will find thrillingly close-to-home. The three people condemned to Sartre’s Hell are “Joseph Garcin,” a Chicago newspaperman, played by Tyler Duke, making his Blue Slipper debut; “Inès Serrano,” a New York postal clerk, played by Kory Gunderson, known for numerous local acting and directing stints; and “Estelle Rigault,” a wealthy socialite, played by Meriweather Campbell, last seen as “Antigone” in a recent Blue Slipper production of the Sophocles’ play. Neil Murphy rounds out the cast as the delightfully diabolical “Bellhop” who ushers the others into their new home. The director and scenic designer is Marc Beaudin, who directed last season’s Proof, and has worked professionally in theatre for over 20 years at venues in Michigan and Montana.